Jeb Hensarling has been a lonely figure fighting earmarks, subsidies and tax preferences. It’s time more Republicans joined him. Texas gave America the Lone Ranger, and then—because it is a generous sort of place—in 2002 it gave the country an updated version of him: Rep. Jeb Hensarling. The Republican has spent a decade riding herd on cronyists who give capitalism a bad name by giving or taking special government favors. With the coming dawn of a Republican Congress, we’re about to see if the rest of the GOP sees the wisdom of joining Mr. Hensarling’s posse. Washington’s Lone Ranger was at it again this week in the fight over reauthorizing the Terrorism Risk Insurance Program, a “temporary” program created in 2002 that requires taxpayers to absorb the costs of insurance payouts after an attack. Mr. Hensarling earlier this year set his sights on the program and methodically elevated the subject of its industry payoffs into a Washington hot topic, causing one unnamed industry lobbyist in October to gripe about the reauthorization delay: “If Jeb Hensarling were not in Congress, a bill would have passed with enormous support.” The Texan didn’t get all the reforms he wanted in the reauthorization bill that did pass this week, but he got some. And he made his point. The episode was classic Hensarling. 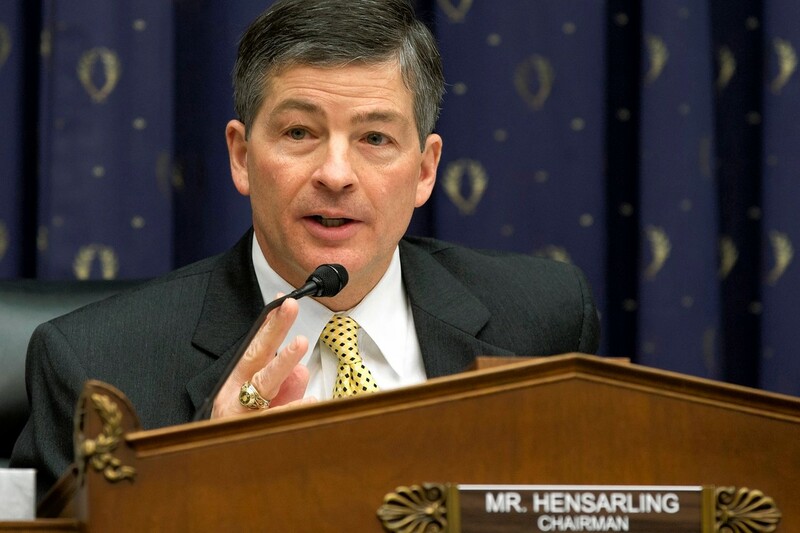 The congressman stepped down from the House leadership after the 2012 election to become chairman of the House Financial Services Committee, where he could be at the center of restoring what he calls the “bedrock” GOP principle of “free enterprise.” From that perch, Mr. Hensarling has doggedly worked to dismantle crony government programs that reward the well-connected business elite. While his efforts have rarely resulted in total victory, they have created flash points and forced his fellow conservatives to publicly justify their mercantilist tendencies. Take his longtime fight to eliminate Fannie Mae and Freddie Mac, the government-backed housing giants that were central to the 2008 crash. Mr. Hensarling has yet to get a House vote on his proposal, though this focus has helped put uncomfortable attention on those pushing only watered-down reform. Earlier this year, he led a battle against plans to roll back reforms to the federal flood-insurance program. The House passed that atrocity, but only after former Majority Leader Eric Cantor (to great outrage) did the insurance lobby’s bidding and bypassed Mr. Hensarling on the way to a vote. This fall he provoked a debate over reauthorization of the Export-Import Bank, which exists to provide cheap financing for select industry players. The bank was set to die; all the GOP had to do was nothing. The House instead caved and threw Ex-Im reauthorization into a September funding bill, though Mr. Hensarling was able to limit its extension to June—when he intends to have that fight all over again. Such fights in the next Congress will be even more worth watching. Corporate America invested heavily this midterm in getting a Republican Senate, in part because it wants nothing more than to get back to the good old Tom DeLay days of mutual GOP-Fortune 500 back scratching. The K-Street lobbyists are about to put enormous pressure on Republicans. Lobbyists will line up three deep outside the offices of John Boehner and Mitch McConnell, demanding that the leadership ignore Hensarling-style reforms. Which gets to the other reason the Hensarling battle over free markets is about to matter more: All eyes are now on the GOP. Republicans are happy to criticize obvious (and Obama -backed) recipients of government largess: the Solyndras of the world. Yet few have been willing to shut down larger programs that pay off entire industries and send dollars back to their state businesses. This is why many voters see the GOP as the party of the “rich and powerful” and Democrats get traction with their populist catchphrases. This ought to be the Republican rejoinder to the Elizabeth Warrens of Congress, who like to complain that Washington is rigged on behalf of billionaires and giant companies. It absolutely is. But Democrats are the ones who are champions of big government, which exists to reward the politically connected, and to hide those rewards within legislation and backroom bureaucratic payoffs. The left isn’t concerned so much about government payoffs as it is about controlling who gets them. The GOP has a yawning opening to make this case, and position itself as the party that truly represents Main Street. Yet to do that, they’ll have to rediscover some principles. A lot of Republicans have used the excuse of a bottlenecked Democratic Senate as a reason not to follow Mr. Hensarling in his rides to kill off the likes of Fannie, Ex-Im or TRIA. They have no such excuse now.